The Beastie Boys are coming back with their eighth album, Hot Sauce Committee Part Two, along with a new 30-minute movie, Fight for Your Right Revisited, to promote the May release. On the heels of the album’s first single, Make Some Noise, comes the movie trailer, featuring Elijah Wood, Seth Rogen, Danny McBride, Will Ferrell, John C. Reilly, Jack Black, Ted Danson, Stanley Tucci, Susan Sarandon and more! The Beastie Boys trailer that has taken over the net is almost cool enough to stand on its own, but we’re in luck: It’s just a teaser! The Fight for Your Right Revisited 30-minute movie promises to be one wild, star-studded party that kicks off where the infamous 1986 Fight for Your Right video ended. Fight for Your Right Revisited features two sets of Beastie Boys, with the young crew played by Elijah Wood (Ad-Rock), Seth Rogen (MCA) and Danny McBride (Mike D) and the crew from 25 years later played by Will Ferrell (Ad-Rock), John C. Reilly (Mike D) and Jack Black (MCA). 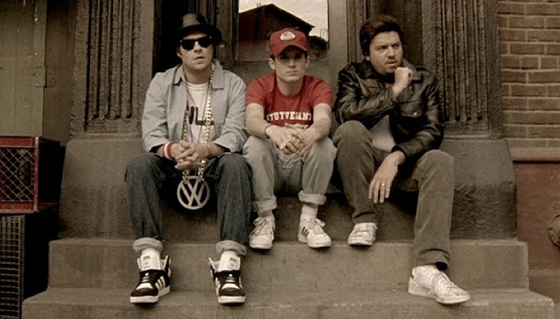 After a wild night, Ad-Rock, Mike D and MCA run into their older selves and are not impressed. How does a crew solve a scuffle with their other selves? With a breakdance battle, of course! “We bring a super-fresh, old-school throwdown dance contest from the future,” Ferrell challenges. During their wild NYC adventure, the Beasties run into characters played by the likes of Will Arnett, Zach Galifianakis, Orlando Bloom, Kirsten Dunst, Jason Schwartzman, David Cross, Steve Buscemi, Ted Danson, Rainn Wilson, Amy Poehler, Alicia Silverstone, Rashida Jones, Chloe Sevigny, Susan Sarandon, Stanley Tucci and Laura Dern. The real Beasties, Adam Horovitz (Ad-Rock), Mike Diamond (Mike D) and Adam Yauch (MCA), show up as cops who put an end to the scuffle between the battling Beasties. 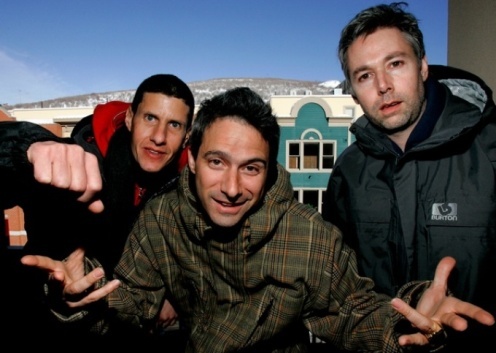 The Beastie Boys’ last hurrah was cut short when Yauch was diagnosed with throat cancer in 2009. Hot Sauce Committee Part One, the first installment of their three-part album, was held back indefinitely and the tour was canceled. A year and a half later, the first album still doesn’t have a release date, but Hot Sauce Committee Part Two drops May 3, along with Fight for Your Right Revisited, which was directed by Yauch (under the name Nathaniel Hornblower)! SheKnows is sending healing vibes to the recovering Beastie. In the meantime, for $74.99 fans get an HD copy of the full movie with a deluxe package preorder of the Beastie Boys’ Hot Sauce Committee Part Two, plus a digital download of the new album, three bonus tracks, a poster and a t-shirt, as well as physical copies on both CD and vinyl.